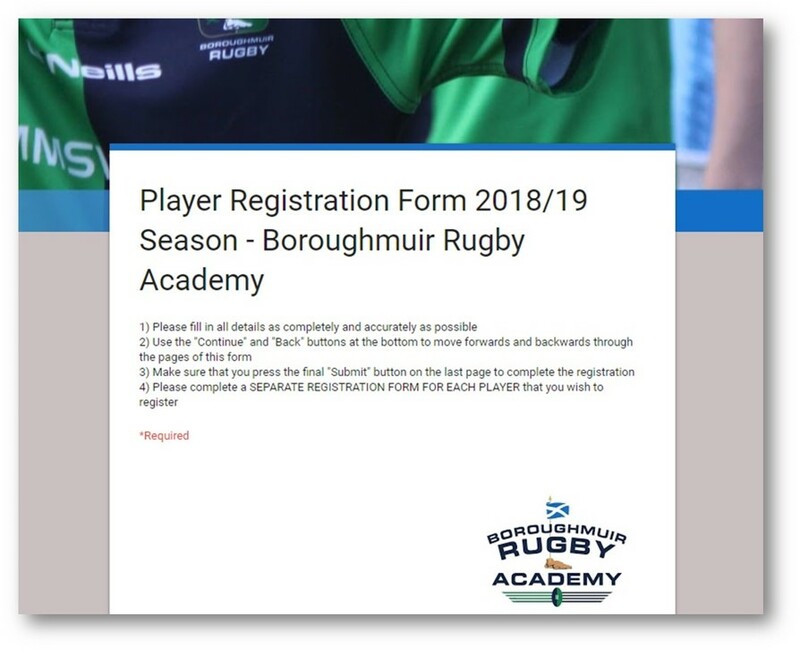 In 2017/18 the Youth Section was rebranded as the Boroughmuir Rugby Academy. 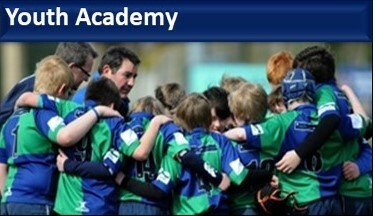 The Academy at Boroughmuir Rugby & CSC is an open and friendly rugby club environment. Our vision is to be the heart of a sustainable community sports club driving rugby success, sporting participation and performance across all ages and gender within our community. You can read about the club's vision for the Academy in its revsed 2018/19 Prospectus (Download it here). 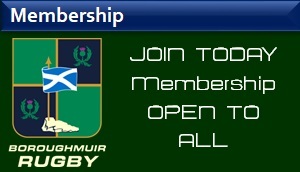 At Boroughmuir we introduce rugby at P1/2 level. 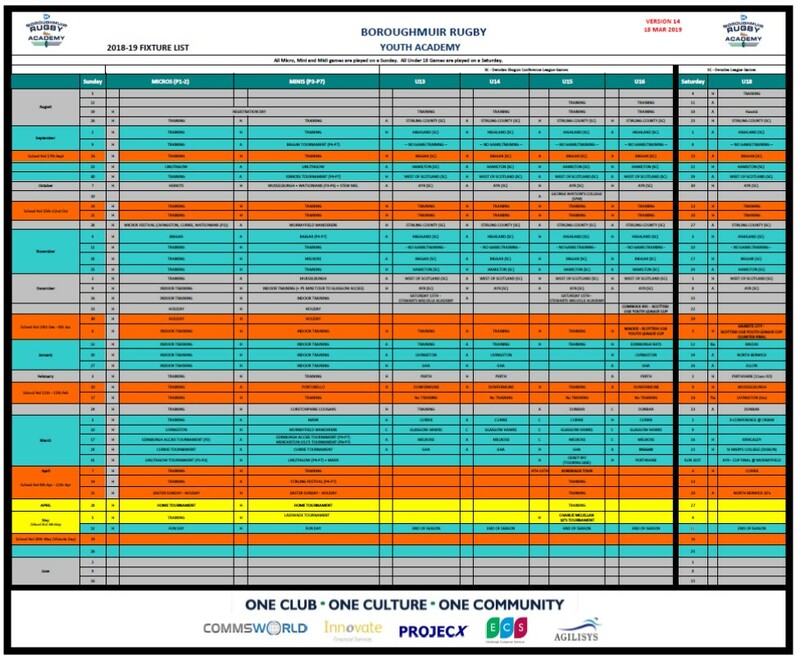 Mini Rugby is from P1 – P7 and Midi Rugby from S1 & S2 to U15 & U16, and Colts Rugby at U18s. For the Micro and Mini rugby teams (P1 to P7) the main training is on a Sunday, 1:30pm to 3:00pm at Meggetland. P5 to P7 also have training on a Tuesday evening 7pm to 8pm. U15's: Training - Tuesday and Thursday evenings (6:30-7:30pm) and matches/training on a Sunday. U18's (Colts) : Training - Tuesday and Thursday evenings (6.30-8pm) at Meggetland with matches on Saturdays. The Registration form for the 2018/19 season is now live. Click here to complete the form. NB: The Player Registration process for the Academy and payment of annual Membership fees are separate processes. If you HAVE NOT yet paid the Membership fees for the 2018/19 season, then in the confirmation email you will receive after completion of this form, you will receive details of the steps to follow to complete the Membership Fees process online, using a Unique Player Reference. 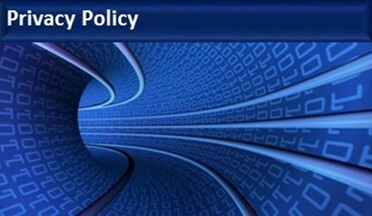 This allows the Academy to reconcile payments and Registration. However, if you HAVE already paid the Membership fees for 2018/19, perhaps as part of a Family Membership, then confirming below will allow us to reconcile this, and you can ignore that section of the email. Fixtures for our Micros, Minis, Midis and U18 are detailed below. You can download a PDF by clicking on this link - 2018-19 FIXTURES UPDATED. Or simply click on this picture. Boroughmuir Rugby Academy Training Kit is available online via the Club's Kit Partner, Surridge Sports. Click on the picture below. Socks and club ties are available from the Bar in the Clubhouse. The Club’s Midi and Youth Section (U13 to U18 squads) play in the Scottish Rugby Club Youth Shogun Conference. 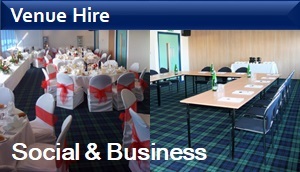 Details of how the Conference is run can be found here. 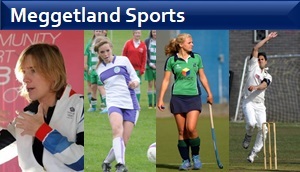 To follow the games our S1 through to U18 squads play in, and see the results, click on the links below. The whole Club Results are available here. 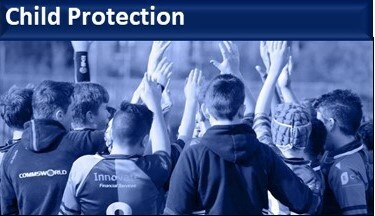 The club's Child Protection Policy can be read here. As one of Edinburgh’s leading clubs we have a great clubhouse and excellent facilities where young players can learn the skills needed to play rugby. We have several grass pitches to train on and have access to an astro and 3G pitch when the grass pitches are unplayable due to weather conditions. The Academy coaching team are all qualified coaches with a variety of coaching qualifications, ranging from Rugby Ready to UKCC Level 1 and 3. Many are former players themselves and are keen to pass on their knowledge of the game in a safe learning environment. Players from the senior squads regularly come along to training to assist with the sessions and to forge links between the junior and senior players of club. Players in the older age groups are taught the SRU Rugby Blueprint which prepares them for progression to the National Player Pathway Program. As a community club we are keen to welcome new players to Meggetland from any school or background, whether they have previous experience or not. For those that haven’t played rugby before we ask that they come along to several training sessions first before committing to membership.